Just a bunch of good, and some not so good, culinary adventures. Around 50 AD St. Paul was sailing around the Aegean sea, more specifically along the coast of Rhodes, one of the Dodecanese islands, when his boat was caught by a terrible storm. He then sailed towards land and reached one of the most wonderful protected bays you will ever see. 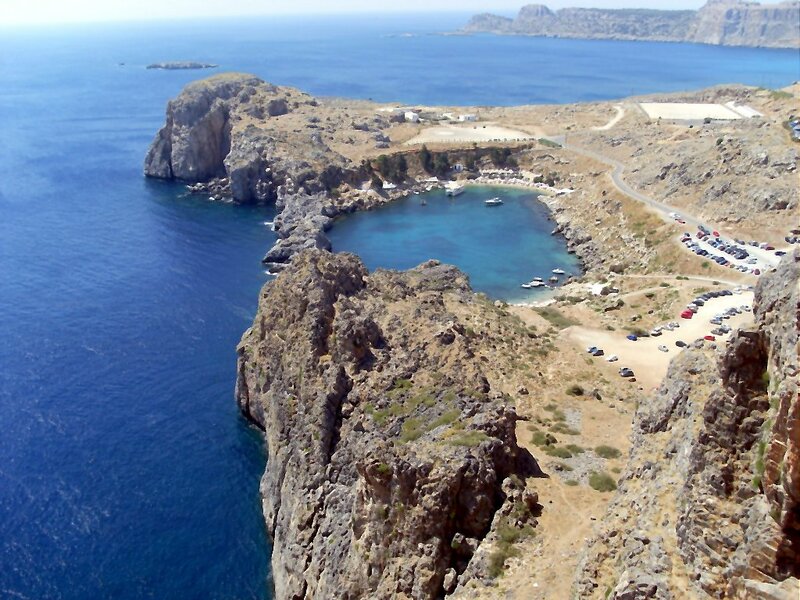 Today known as St. Paul’s Bay, in the village of Lindos, it is a unforgetable view, specially seen from the Acropolis, at the top of Lindos hills. In the Greek hot summer, after reaching the top of the hills and enjoying such a marvelous view (I won’t even mention the Acropolis itself), if you are a normal human being, and not a saint as Paul, you should be thirsty as hell (even though I presume saints get thirsty too). One suggestion, don’t drink anything. Resist. Be strong. Walk all the way down and go to the Pallas beach. Walk, don’t ride the poor donkeys available for the lazy tourists. There you will find a couple of small bars/restaurants, and I guess any of them will do (I sat at the one with the blue roof right in the middle of the above picture). Then, order a bottle of ouzo (my favorite one is Plomarion, from Plomari, in the Island of Lesvos, the capital of ouzo), a tall glass filled with ice to the top and some mineral water, relax and enjoy, after all you’re in Greece. Clearly, you won’t be able to drink ouzo for very long on an empty stomach, that’s when some seafood should be more than welcome. 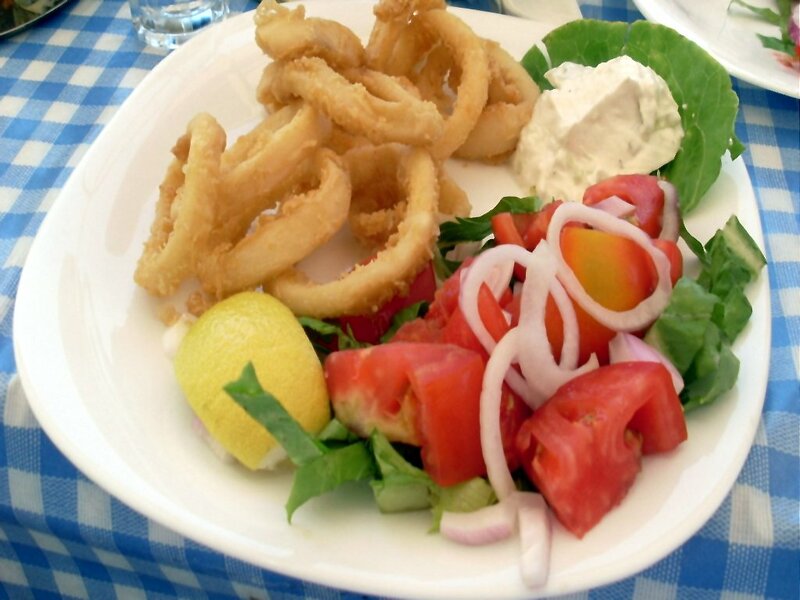 I ordered some squid, fried to perfection, with a very simple salad (tomatoes, onions and lettuce) with tzatziki (you can find dozens of different recipes on the web, this one here is very basic – use high quality yogurt). As you can see, the squid was covered with a nice looking batter, which I assume was prepared by mixing some seasoned flour with cold sparkling water, as it was filled with small gas bubbles, which usually form when a batter loaded with dissolved gases (what you achieve by keeping the temperature low), carbon dioxide in this case, gets in contact with hot oil and tries to leave the mixture. The final result is a very thin, crispy and flavorful coat, which does justice to a fresh squid such as this one. Nothing could go along better with your second, or third, or fourth…. (how many???) glasses of ouzo. Around 17 years ago, when I had the opportunity of working in Germany as a guest Professor, one of the most popular fast foods in the Bonn area was “gyrus”, a Greek specialty which literally translates as turning, served with “tzatiziki”, a wonderful fresh cucumber and yogurt sauce. Well, I arrived in Heidelberg this morning and was quite amazed to see that “gyrus” is almost unknown and that the Turkish “döner kebap” (or kebab) has taken its place (Interested in kebap? Take a look at the post on Adana Kebap). Not that the Turkish variation may not be as good as the Greek one (I tried the one served at Charisma, Bergheimstr., 35 – GPS 49.408557 Lat. N, 8.688898 Long. E), but it’s surelly different, as it never contains pork for religious reasons (I personally prefer pork to chicken). Let me cross my fingers and see what dinner will bring. Will try to stick to a more typical of German meal, something like a Bratwurst, for example. P.S. : I have just been informed by my son that, luckily, the Greek specialty has kept its place in the most northern parts of the country. Rhodes is the capital of the Dodecanese, a group of 12 main islands spread in the Greek Aegean sea (dodeca means 12 in Greek). During summer the beautiful city of Rhodes is full of tourists, specially in the Old Town and around the port entrance, were the Colossus of Rhodes, one of the seven wonders of the ancient world, once existed. Although, the city is really wonderful, and not to be missed, to rent a car and adventure yourself through the interior of the island is, I belive, something to be done. Get your car early in the day and drive along the west side of the island to the Temple of Apollo, a few minutes from downtown. Once there an excellent option is to do some jogging, yes, that`s right, jogging. It`s a wonderful feeling to jog in an ancient stadium, and almost alone, as the place is virtually free of tourists during early morning. You can almost hear the crowd that used to gather here to watch Greek games, more than 2,000 years ago, cheering you up. From here you can keep driving to the Petaloudes, or Butterfly Valley. Expect some tourists there. 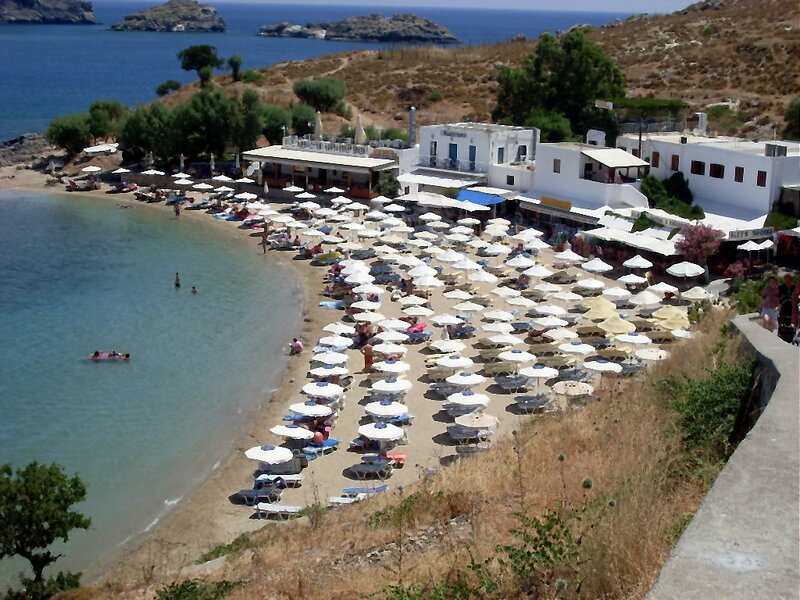 If you prefer the sea, stop in one of the beaches and refresh yourself (a good option after the jogging). If you prefer to go through the interior of the island, what we did, do not miss the small church of Saint Nicholas (Aghios Nikolaus) near the town of Psinthos. Since the place is out of any tourist route you`ll probably find yourself completely alone. When we got there a man was taking care of the garden, and after some little friendly talk he seemed to be more than glad to let us inside the building. Now it`s lunch time, and that`s what matters here. Drive to the small town of Empona (or Embona), at the base of mount Attavyros. There you’ll find a couple of small restaurants one of them (sorry, I don`t remember the name) looked just right for lunch during a hot summer day, as it was completely open and received a much welcomed refreshing breeze. I ordered Stifado (or Stifatho) which is an easily recognizable stew, as it includes lots of onions. The word “stifado” is believed to come from the word “stufado” (inflated, full), brought to Greece by the Venetians in the 13th century, after the fall of Constantinople (1204). I`ve seen many stifado recipes employing tomatoes, but since such vegetable was introduced in Europe by the Spanish only after the discovery of the Americas, in the XVI century, it`s completely impossible that it was present in the most traditional versions of the dish. In fact, as expected, it was absent from the one we had in Embona. The recipe was rather simple, as explained by the waiter. Meat is sealed in an adobe pot with olive oil (Greek oil, of course), to which garlic and several spices are added (minced rosemary, 2-3 cloves, 1-2 laurel leaves and 1 small cinnamon stick). Onions are separately fried (also in olive oil) and reserved. After cooking for 1-2 min some red wine vinegar (2 table spoons), red wine (100 ml), honey (1 table spoon) and water (about 0.5-1 glass) are added. The pot is then closed and left to cook on low heat for a couple of hours, being occasionally stirred (also check the water, as it should not be let to dry). After the beef is really tender the onions are added and left to cook for an additional 30-45 min. Don`t forget to season. Our stifado was served with a home made garlic, mint and sesame seed bread, along with olive oil. Unforgettable! Rate my blog! It just might help to improve it. What other blogs have I been reading?